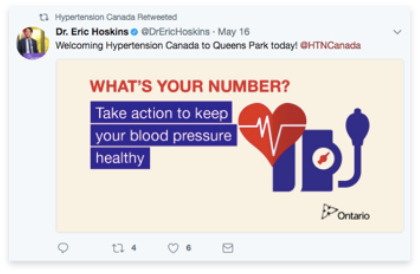 Hypertension Canada enlisted Santis Health to plan three provincial lobby days in Alberta, Manitoba and Ontario in May 2017 coinciding with World Hypertension Day on May 17. Santis led the planning and management of the three events, which included coordinating a lunchtime education reception for members of Hypertension Canada and experts to connect with MLAs and MPPs while raising awareness of the importance of blood pressure screening, as well as the prevalence and severity of hypertension across Canada. Santis led all aspects of the planning and management of the activities for each lobby day. Santis also provided strategic counsel and oversight on event materials, including educational and promotional materials. MLA Dr. Bob Turner in Alberta. 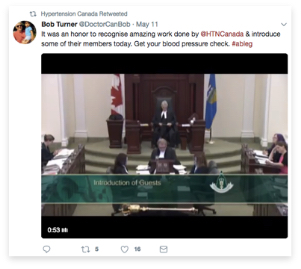 MLAs and MPPs also amplified Hypertension Canada’s message by mentioning their event on Twitter. Your Team is amazing. You stand out because you scoped the work up front, considered how it fit within your current portfolio, and then follow through on every single step and deliverable. I suppose that’s what all organizations should do, but they don’t. Santis Health does. I’m so thoroughly impressed, and grateful. It is a PLEASURE to work with your Team.